A moving car is a complex symphony of sound, most of it reassuring—tires humming, engine rumbling, tailpipes roaring. But every now and then a dissonant note creeps into the mix—and the alert driver’s ears prick up: Did you hear that? Here’s a guide that identifies those oddball sounds and helps you sort out which conditions you can let slide and which ones mean repairs—and how fast you need to make them. WHAT: Flat-spotted tire. As the tire rotates the flat spot thumps on the ground. Nylon-cord tires will flat-spot overnight and make this sound until they warm up. It’s usually worse in colder weather. You can permanently flat-spot the tires by locking up the wheels, grinding massive amounts of rubber off the tread in one spot. FIX: Replace your nylon tires with steel-belted tires. If you’ve ground down your tires like a pencil eraser, you can either live with the vibration until wear reduces the flat-spotting or buy new tires. URGENCY: It’s not getting better on its own. The blowtorch of corrosive gases will eventually damage the manifold. Oh, by the way: Carbon monoxide from the leak may make you drowsy or dead. URGENCY: That’s really just an urban legend about cars polevaulting over broken driveshafts when U-joints fail at speed, right? WHEN: Slowing down; it’s sometimes worse on damp days. WHEN: Anytime the engine is running, but it’s most noticeable at idle speed. URGENCY: If you’re wondering why your Check Engine light is on and why your car idles poorly, this is probably why. URGENCY: Annoying, but They All Do That—or at least some of them do it some of the time. 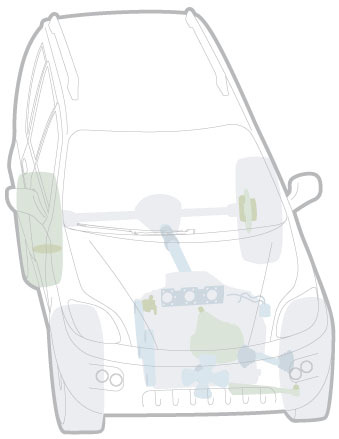 WHAT: A CV joint that allows your front wheels to turn and still be powered is loose. The boot has failed and let out all the CV joint’s grease, or maybe it’s just time for it to wear out. URGENCY: Don’t leave town. Don’t use a lot of throttle around sharp turns. Your car will stop suddenly when the joint completely fails. WHAT: The pressure relief valve inside the pump is dumping excess power-steering hydraulic fluid back into the reservoir. It’s supposed to do that, although maybe a little more quietly. FIX: It’s normal. Actually, you should check the level of powersteering fluid in the pump. Don’t hold the wheel hard on the stop like that; it annoys pedestrians and is tough on the belt. URGENCY: Make an appointment, and don’t take a long trip. This won’t go away on its own—until just before the belt fails.